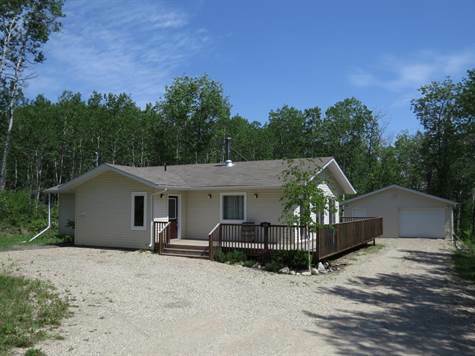 "Perfect cottage or year round retreat"
Built in 2012, this well maintained 1367 sqft home is ready for your enjoyment. The 3 bedroom year round bungalow features an open style concept with vaulted ceilings, 2 baths, a wrap-around deck measuring nearly 700 sqft, and a garage that is heated and insulated with a workspace. The newly stoned driveway leads to a 12x12 screened sunroom off the back to enjoy all those summer evenings. Just minutes from downtown Wasagaming, this lot, which green space borders the East and South boundaries, is nearly 3/4 of an acre and located in the Grey Owl Resort Subdivision. A great opportunity to enjoy the lake year round. Call for further details.